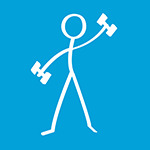 Going to the gym regularly and doing weights, or resistance or fitness training in general, has a goal attached to it. For most men and women their goal might be either to put on a bit of weight because they are under the impression that they are too light, while another goal might be to take off some weight as they feel they are too heavy. The original drive to do gym exercises might have been to look good, be slim, lose weight, be strong, build self esteem and emotional protection, and for a sense of security. Some people also go to the gym as a way of preparing to look good for an upcoming event such as a wedding, beauty event, photo shoot or anniversary. After a short time training, men can often develop a desire to be bigger and stronger. After all, the fit guys at the beach are said to attract the pretty girls and get recognition from other men. But what if we could take enjoyment in going to the gym simply for the fact that we move our body and muscles and have the opportunity to feel the entire body as well as specific areas and muscles working, leaving us feeling vital and energized for the rest of the day and days ahead. Making this the true purpose of going to the gym will support us with our Daily Activities of Life. Taking the ideals, beliefs and any agendas out of the workout can support people to make workouts much more pleasurable, stress-free and also easier to commit to and stick with. Workouts then become a purposeful and loving way to support the body. The media, advertising, Hollywood, magazines and celebrities certainly have influenced how we think about fitness, health and going to the gym. However, pictures and movies are digitally enhanced. Further, fitness models and celebrities put themselves through inhuman and often health destroying procedures before a photo shoot or filming of a movie, such as dehydrating and starving themselves for days. This is done so every muscle contour and vein pops up and 'looks good' in the photo or film scene. This is then the image we are told is an example for total Fitness, Health and Vitality. This unhealthy and false image is then taken on by the newcomers and fitness enthusiasts/fanatics who try to achieve this. The images we are sold are not real and trying to achieve them sets people up to fail and even worse, damages the body. So what if the true purpose of going to the gym is to support ourselves? For example, being able to work as a health practitioner and have a body that is able to do a long day standing at the treatment table 60-80% of the time, treating patients with musculoskeletal issues. This includes being able to lift their legs, arms and head in order to treat them – and some of those legs can be very heavy – so being able to support the patients without putting the practitioner into a position where they wear out their own back and body could be the priority for years to come. If you work in the building or landscaping industry you may need to be able to lift, push, pull and shovel heavy material. This may influence your gym workout plan also. Even if your work were highly physical, I would still recommend committing to a fitness program that specifically supports the physical work you do. On a general note, it is a fact that most people either under-exercise or over-exercise. From a health perspective, we often have to encourage patients to look at the fact that they never do the right amount, or enough that is needed to support them. It is either extreme – over-exercising or not enough/not at all. Both have physical consequences on the human body. If the heaviest weight a person lifts on a daily basis as an office worker is a pencil or a pen, they do not need to go to the gym and bench press 180kg to support the work they do. Being sick with a cold or flu is another reason to lay off the gym. Some gym goers believe that their fitness levels will be negatively affected if they take a break for a week, or even a day or two. These rest days will actually support you to return fresh which supports you to enjoy the benefit of the workout when you return. Consider also that some days your body might just need a light workout, stretches or even just a walk. Most people are fine with having short periods where they don’t exercise as long as they don’t extend for more than a week or two at the most, especially if the break is due to illness, travel or just the feeling of needing to slow down. Exercise programs should therefore always be individual and flexible to your lifestyle and daily activities.